All of the pieces in this collection are not only functional and colorful, but safe for food use. These pieces are all handpainted and highfired. These beautiful handpainted napkins rings are the finishing touch to any table. This handpainted spoon is a nice additon to any small serving bowl for condments and the like. Lead-free and dishwasher safe. This handpainted creamer is lead-free and dishwasher safe. This handpainted coffee mug is lead-free and dishwasher safe. 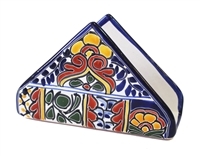 This handpainted napkin holder looks great on any table or counter. These whimsical frog salt and pepper shakers will "jump" out on any table. This sauce boat with handles is a great addition to any table. Great for side sauces or condiments. Handpainted, lead-free and dishwasher safe. This set of salt and pepper shakers will add beauty to any table. It also looks great as part of the many other items available on your table. Keep your counters and cooktop clean with this large easy to use spoon rest. It is handpainted, lead-free and dishwasher safe. "Chip and Dip Plate - 12"" Diameter x 1.375"" High"
This handpainted sugarbowl makes a great compliment to our creamer and coffee mug. Lead-free and dishwasher safe. This beautifully handpainted butterdish with cover adds beauty to any table. A great way to service nachos and salsa. Handpainted, lead-free and dishwasher safe. "Wine Chiller - 8.375"" x 8"" Tall"
This beautiful, handpainted wine chiller will make a statement at any party or table setting. Can also be used as a storage container for kitchen utensils because of its unique shape.